Capt. Jeremy A. Chandler was born on July 25, 1975, in Alabama. He was a Special Forces officer assigned to 1st Battalion, 3rd Special Forces Group (Airborne) at Fort Bragg, N.C.
Chandler died August, 11, 2005, while he was preparing for combat operations near Tarin Khowt, Afghanistan. He deployed to Afghanistan in support of the Global War on Terrorism. This was his third deployment to Afghanistan. 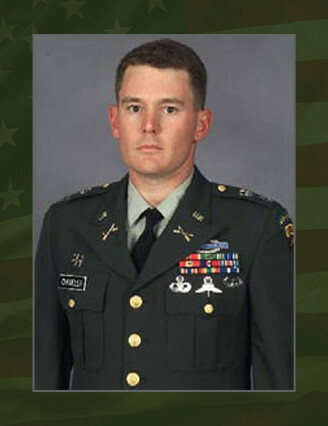 A resident of Raeford, N.C., Chandler was commissioned in the Army immediately following graduation from North Georgia College in Dahlonega, Ga., in 1997. He majored in history. He graduated from basic airborne and infantry officer training at Fort Benning, Ga., in 1998 and was assigned as an as an infantry officer with the 1st Battalion, 187th Infantry Regiment, 101st Airborne Division (Air Assault) at Fort Campbell, Ky. He deployed with the battalion to Kosovo in 2000 supporting Operation Joint Guardian. In 2001, Chandler volunteered for Special Forces. He was selected for and later graduated from the Special Forces Qualification Course. Upon completion of Arabic language training in 2003, he was assigned to 3rd SFG here. He earned his military free fall jumpmaster qualification in 2004. Military free fall is an advanced special operations skill. Chandler’s military education and schools include Basic Airborne Course, Infantry Officer Basic Course, Ranger Course, Armor Officer Advanced Course, Combined Arms Services Staff School, Special Forces Qualification Course, Jumpmaster Course, Military Free Fall Course, Military Free Fall Jumpmaster Course, and the Survival, Evasion, Resistance and Escape Course. Chandler’s awards and decorations include a Bronze Star Medal for valor, three Army Commendation Medals, Army Achievement Medal, two National Defense Service Medals, Kosovo Campaign Medal, Afghanistan Campaign Medal, Global War on Terrorism Expeditionary Medal, Global War on Terrorism Service Medal, Army Service Ribbon, NATO Medal, Air Assault Badge, Combat Infantryman Badge, Expert Infantryman Badge, Master Parachutist Badge, Master Free Fall Parachutist Badge, Special Forces Tab and Ranger Tab. His posthumous awards include the Bronze Star Medal for valor, Meritorious Service Medal, and Army Commendation Medal. He is survived by his wife Wendy, of Raeford, N.C., his parents, Lt. Col. (Ret.) Alan and Jonnie Chandler of Richmond Hill, Ga, and his sister, Alecia Chandler Wilder of Hanford, Ca.